We are bulk manufacturer of Gypsum Granules, we cater this product to our industrial clients on B2B basis. These are granules made of Phospo gypsum (CaSO4.2H2O) it is a good source of calcium and sulfur. 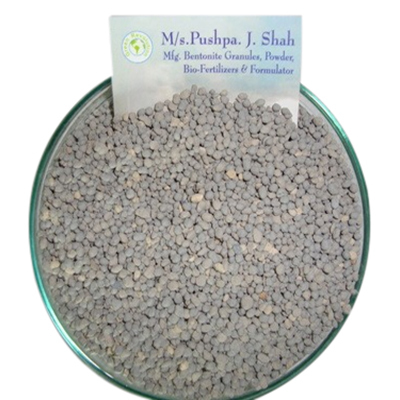 Bentonite clay is used as a binding agent to form spherical granules. It is a well-known fact that Gypsum is a soil conditioner which is the cheapest and nature friendly source of secondary nutrient calcium and sulphur. It can be applied on all crops at any stage. 1. Gypsum looses the tightness of the soil and allows water as well as other nutrients to penetrate it and reach deeper to the root system of the plants. 2. It helps in reclaiming the saline and alkali soil. It gives good result with a very low input cost. 3. Supplies vital nutrient to plant as readily available calcium and sulphur without significantly affecting soil pH. 4. The calcium of gypsum is 150 times more soluble than limestone. 5. Mitigate soil acidity and aluminum toxicity, where its calcium ions displace aluminum ions from the soil. 6. In sodic soil gypsum provides Ca that can exchange with Na and Mg, thus leading to flocculation of soil particles. Sodium can also be leached off as sodium sulfate. 7. Increased calcium uptake by roots can decrease the pH of the rhizosphere. 9. It conditions the hard soil by breaking compounds of insoluble remains of chemical fertilizers. It is compatible with chemical fertilizers.